Do you need extra help for EL students? Try the Division with Fair-Sharing Language pre-lesson. Find interactive books for each child's level. Students will be able to complete multi-digit division problems. Tell students that today they will be learning how to solve multi-digit division problems. Review long division with students. Complete a few review problems on the board where students can observe your steps and recall any strategies you have taught them up until this point. If possible, have students use mini whiteboards to solve warm-up problems independently. 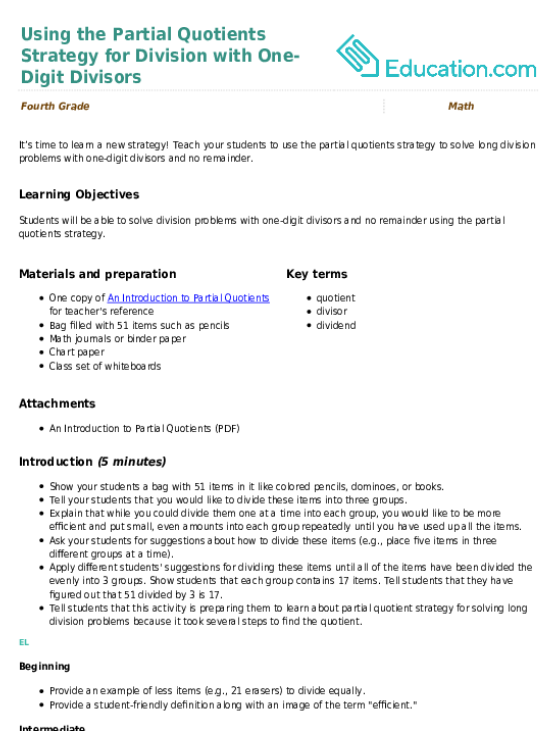 Review key vocabulary relating to division, such as "quotient," "dividend," and "divisor." Ask students to share how they would solve a division problem with more than three digits for the dividend. Allow students to use their home language (L1) or new language (L2) in their discussions. Ask students to write the steps for completeing a division problem using the standard algorithm. 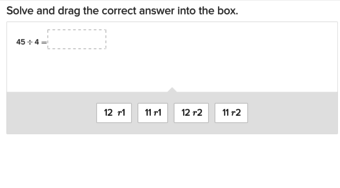 Have students copy the teacher example for one of the division problems before asking them to solve it on their own. When they solve a new division problem, ask them to share their quotient and their process with their elbow partner or the teacher. Pass out the Solve the Division Riddle worksheet. Complete the first and second problems by displaying them on the document camera or whiteboard. 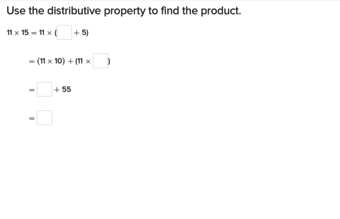 Allow students time to complete the first five problems on the sheet. Answer any questions students may have about this review. Make sure students understand that on this worksheet, they will spell out a specific word to solve the riddle based on the quotients they get by solving the division problems. Read through all the directions and ask students to restate them to you. 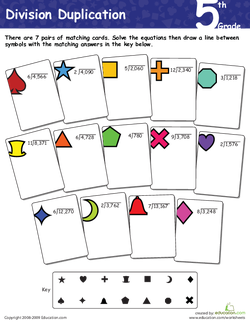 Provide vocabulary cards for the key terms and ask students to rephrase the definitions as they go (e.g., "divisors," "dividends," "quotient," "riddle," "standard algorithm," etc.). Have ELs restate the method for solving division problems. Shorten their assignment to allow them time to explain their process after completing each division problem. Hand out the Division Duplication worksheet. Model problems on the board as needed. Take time to focus on the steps of long division. Do not rush through the steps. Share and record the number of pieces you put into each group (i.e., 6 tens into each of the 5 groups). Multiply the number you put into each group by the number of groups (i.e., 60 x 5 = 300). Subtract the product from the dividend to record the remaining pieces (i.e., 345 - 300 = 45). Repeat steps 1–3 until you cannot share equally between the groups anymore (i.e., the dividend is smaller than the divisor). Ask students to restate the steps needed to solve the division problem. Have them model the process of borrowing and sharing with base ten blocks or using symbols and a place value mat. 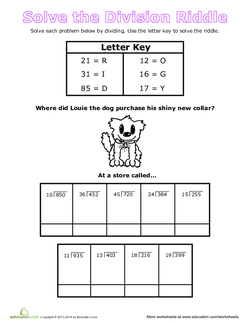 Allow students to work independently on the Zoey Chase Is on the Case worksheet. Give them time to share their answers with their elbow partner and adjust their answers on their papers if necessary. Form a small, teacher-led group so you can ask clarifying questions after they solve each problem. Ask students to share their answers with you, telling you the steps they followed to solve the problem. Shorten the assignments to allow students to focus on solving the long division problem and then explaining their answers to their partner. Pull aside struggling students for extra assistance. Ask students to share their answers to each problem as they complete them. Allow students to use a graph paper and color-code their work as they complete the division problems. Encourage students to use the division method that is best for them. 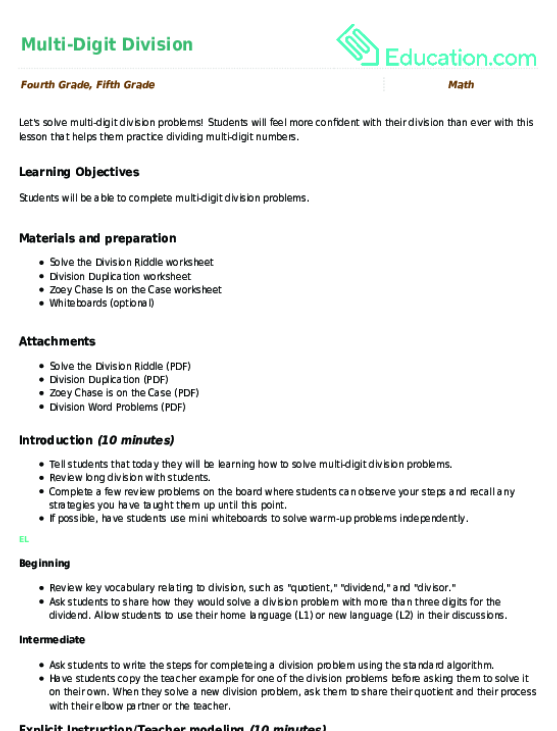 Have students relate the division dividends and divisors to their multiplication counterparts (i.e., the product and one factor) to focus on the inverse relationship between multiplication and division. 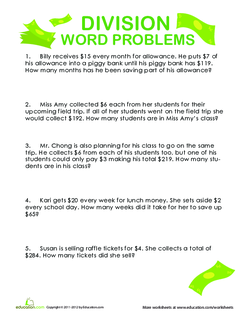 Advanced students could be given the Division Word Problems worksheet to complete. Have students share one of the problems they liked the best or the most challenging problem with the class during the Closing section of the lesson. Bring students together into a group. Review worksheets students have completed. Answer any questions students may still have about the lesson. "For question ____, my answer is ____." "I first ____, then I ____ to get the ____." "Then I ____ to get the ____." "Lastly, I ____ to get the quotient ____." "I think the right answer is.."
Ask students to think of real-world applications for the kind of math problems they encountered today. Have students share their ideas with the class. Take any final questions your students have about the lesson. Allow students to share their real world examples with their partners before sharing with the whole class. "One real world division problem could be dividing..."
"Another real world division problem could be dividing..."
Model, or have other students model, using the sentence frames before asking ELs to use them in pairs. Have students restate a student's real world example and then add to it. 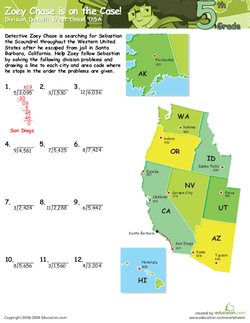 Give your little math whiz some practice with more difficult division. She'll divide single or double digit numbers into a triple digit number. Teach your students to use the partial quotients strategy to solve long division problems with one-digit divisors and no remainder. 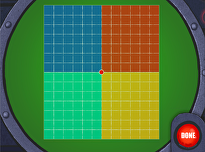 Don't be square, have a little fun with division! Each row and column is a division problem. Can you fill in the blanks? 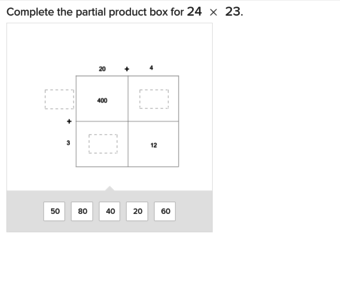 Help your fourth grader practice division with this simple worksheet. Solve the division problems inside each fish, then only circle the fish that have no remainders so that Phil, the picky division shark, knows which ones to eat!